Les Vigiles de Charles VII, manuscrit de Martial d’Auvergne, vers 1484, BnF, Manuscrit Français 5054, enluminure du folio 8 verso. Introduction: The biggest problem facing the historian of medieval political culture is how to access the consciousness and beliefs of those outside the nobility and clergy. Even when members of the lower orders are given voice in sources, such as judicial records, or when their actions are described at length in chronicle accounts of revolt or town ceremonies, this version of their experience is mediated not only by the fact that it passes through a text, but further by the fact that this text was written by someone from a literate minority, generally from a position of power and often hostile to the concept of an active and politically engaged populace. Many scholars are content to allow elite expressions of a political ideal to stand in for the whole of medieval society and, thereby, incorrectly characterize the commons as essentially apolitical or as eager participants in the maintenance of the authoritarian ideology that undergirded most medieval political texts. However, the numerous outbursts of violence by common people in the late Middle Ages, which include major revolts in 1306, 1356-1358, most of the 1360s and 1370s in Languedoc, from 1380-1383, 1413, and 1418 as well as chronic smaller-scale resistance to tax collectors and royal officials, expose the idea of a passive commons presented in these texts as wishful thinking. Any scholarly analysis that uncritically accepts elite texts as constitutive of the whole of medieval political culture is telling a drastically incomplete story. Understanding the commons’ violent resistance, therefore, must be at the center of a wider, more inclusive late medieval political-cultural history that has yet to be properly told. Recent historians of violence have provided excellent methodological tools to penetrate textual biases and explain the cultural and historical contexts for violence, but they leave us short of understanding the act of violence itself. 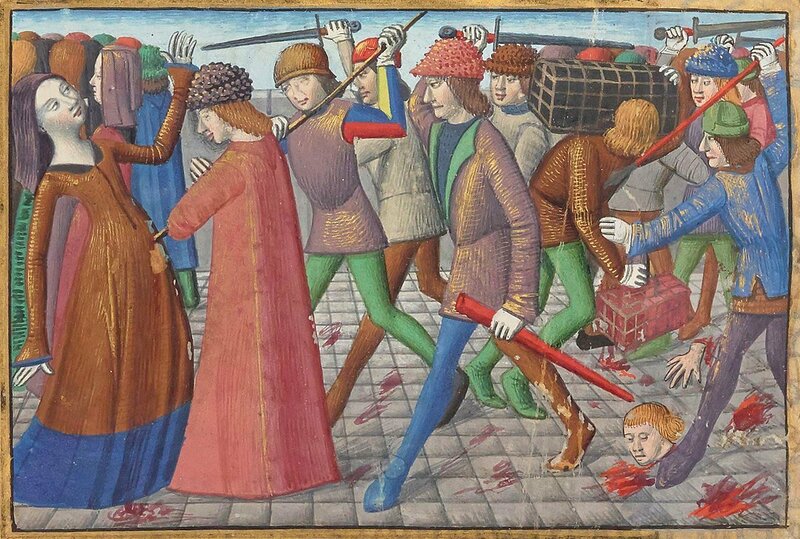 Medieval thinkers understood violence as a force with dangerous transformative power. Their conception of violence preserved its essential nature as an act, connected to but independent of its context, an interjection in the flow of events that led up to it. The Paris massacres of 1418 and the discussions that surrounded them provide materials for a rich and varied case study of this concept. The commentaries written about these events reveal some of the fundamental ways that late medieval people understood and explained the nature of violence.